Watching movies way past their theatrical debt entails a management of hype from cultural osmosis. I don’t look for it, I just get it. Shocker here. I’m pretty confident in my own opinions. So I didn’t go into Pi expecting the Moon and all the Stars. Well… then the film itself promises it. The writer who is interviewing adult Pi about his life says (paraphrasing) “your Uncle says this is one of the greatest stories ever told and will make me believe in God”. I tensed a bit when that was said. Why would a film ever do that to itself? Maybe it was meant to disarm the audience. Because even with all the hype surrounding this thing, I felt like it was the underdog right then. The film under its own expectations. Accident or not, I’m rooting for this thing now so bully for Pi. Such a trick really wasn’t needed. As a matter of fact, the writer character really wasn’t needed. Adult Pi is such a natural talker that something so weakly contrived as a writer needing a story isn’t necessary to get him rolling. Irrfan Khan plays it just right with an understated performance to ground the spectacle that follows. Though the fun stuff takes a while to come around. Up until Pi’s boat sinks it’s mostly sappy, crappy, cliché. Pi trying to connect to the soul of animals by looking into their eyes. I get that it’s about a young Pi growing up. Straddling the adult and child worlds, “is what it is” and “everything’s magical”. I stilled gagged. Especially since Pi doesn’t fully refute the silly personification of… everything. Every little thing is a lesson sent directly from God to educate our young fella. The film will ask questions about belief or meaning but the answers it provides are shallow, relying on (outstanding) CG work to dazzle the audience and work on their sentimentality. I felt like young Pi when he asked a priest about Jesus and got some gibberish ring-around reply, “that doesn’t make sense!”. Plus, the CG creates a disconnect. Everything is rendered convincingly, but the singular nature of what’s shown makes it unbelievable. It’s too pretty, too real, too much unlike the gray / brown world I live in. And I mean, I should believe in God because CG tigers and fish look so real? Pi’s journey is so obviously fake / clearly romanticized I can’t apply it to my own life. Or really take his seriously. Whole family dies? Aww. Oh well. Sure was beautiful when they drowned. As a film: Don’t tell the audience you’re aiming for their heart! They will guard it! 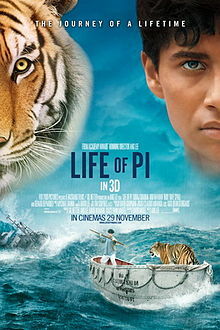 One must sneak in… Life of Pi is… nice, but has the impact of a pleasant breeze.